How you Can Help the Crows.net Project. The Crows.net Project represents a new sort of research venture, one in which any person with an interest in crows and access to the internet can take part. The direction of the research and the manner in which the information will be stored, sorted, and analyzed will depend, to a very great extent, upon the material submitted and the suggestions made by those who take part in the project. Advances in computer technology and the Internet make collecting and comparing certain kinds of information infinitely easier than in the past. For example, a comparison of the vocalizations of crows throughout their entire range, both in the form of audio recordings and sonograms, is now possible and relatively simple. Where previously researchers had to describe vocalizations as written transcriptions, which could be interpreted differently by various readers, now the actual call can be made available as a sound file and presented graphically as a sonogram. PLEASE NOTE: All observation reports should contain the location (Town/City/County, State/Province, Country) at which the observations were made and the date of the observations. 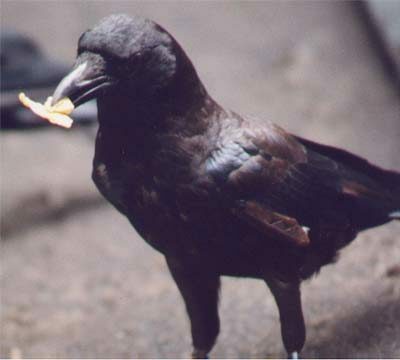 Observations both of "routine" crow behavior, and more extraordinary behavior which might demonstrate learning ability and adaptability, are all needed. As information comes in, it will be categorized and posted on the site. You may also use the form to ask any crow related questions you might have. Unless you request otherwise, all submissions of interest to Crows.net visitors, including questions and answers, will be posted on the site. If you don't want your name or e-mail address posted with your submission, please let us know. PLEASE DON'T FEEL RELUCTANT TO ASK QUESTIONS! WE'VE BEEN FINDING THAT SOME OF THE MOST INTERESTING INFORMATION HAS RESULTED FROM THE QUESTIONS VISITORS HAVE ASKED. In addition, all suggestions and comments on developing the Crows.net Project are most welcome. You can help the crows.net project financially, at no additional cost, by doing your shopping at Amazon.com through our website. We receive a percentage of the purchase price for every item bought from Amazon.com using a link from our website. You can access Amazon.com from the link on our “All About Crows” (Contents) page, of if you are looking specifically for crow related books, use the “Bookstore” link on the “All About Crows” page. Remember you can use the crows.net links to purchase anything at all from Amazon.com, not just crow related items. It’s the easiest way you can help crows.net. © Copyright 1999 - 2010 Michael J. Westerfield. All Rights Reserved.